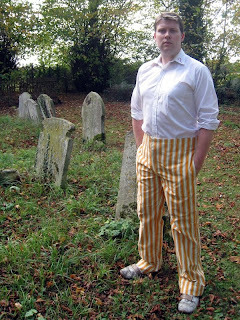 and one of my clients, Chris, kindly wrote a review of his Season 21 Trousers. 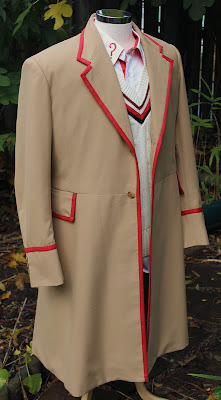 The one thing that always surprised me when talking about the Fifth Doctor’s costume was that no-one seemed to be able to notice the difference between his first and last season costumes. To me it was blatent but to most it wasn’t. 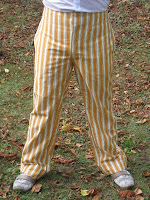 I had tried to commision other well known costume makers in the past to make the last season trousers but was either told that they were all the same material(!) or that there wasn’t enough interest in them to bother. You can imagine how thrilled I was when I found Steve on-line who not only could see the difference in the materials but had produced an amazing replica material that looked spot on. Of course I had to have a pair! Steve was amazing. He took time to keep me informed every step of the way. If there was going to be a small delay I would receive an email explaining why and I felt like I was never in the dark. 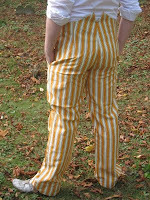 The turn around time on the trousers was amazingly fast, especially for the quality of the finished pair! Feeling a bit like a kid at Christmas, I felt over excited when they arrived and once they were unwrapped, I couldn’t wait to put them on. 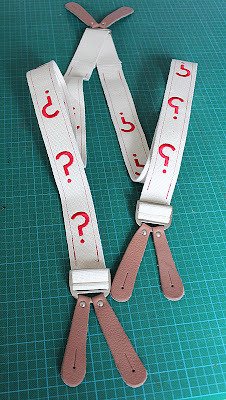 I was slightly concerned whether they would fit (doing measurements over emails could go wrong I thought) but they were perfect. Extremely well made and finished with a real professional eye for detail. As soon as I had them on, the DVDs and photos all came out and I can honestly say that they are as near to the originals in accuracy as I think it would be possible to get. It’s a pleasure to deal with Steve!